If you love blueberries like me, you might fall in love with the deep blue of these potatoes. Original, surprising, and sensational, colored potatoes add so much fun to your traditional dishes, and their health benefits are plenty. First cultivated in the mountainous regions of Peru and Bolivia 3000 to 7000 years ago, potatoes arrived in Spain in 1570 by Spanish boats. Used first to feed livestock, they eventually became part of the farmers’ diets when other food became short. The popularity of this vegetable soon spread all over the world. This remarkable tuber is adaptable and easy to grow anywhere. 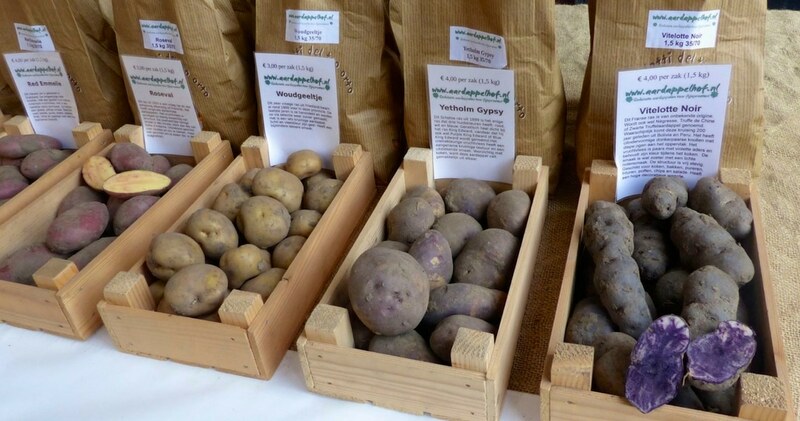 Amongst the 2000 varieties of potatoes existing in the world, the colored potatoes (blue, violet, pink, yellow, red) are the most surprising and interesting types. The more they are colored, the more health benefits they offer. 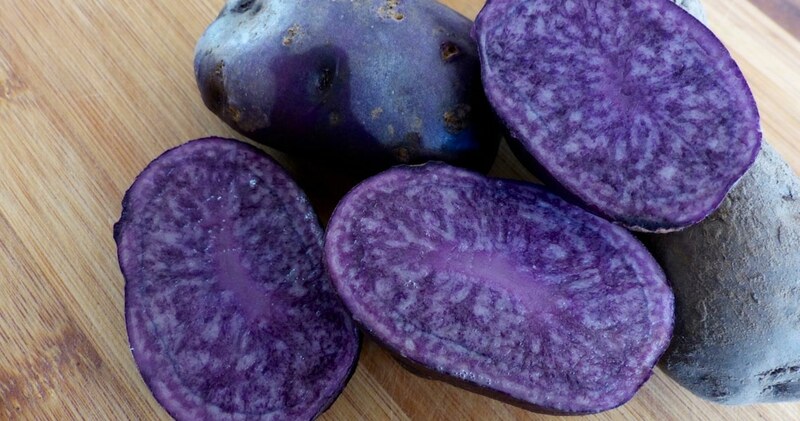 All Blue, Vitelotte, German Black, Peruvian Blue, Edgecote Purple, Russian Blue – the blue potato comes in various varieties and shades of blue. The All Blue’s origin is ancient, coming from the Andes in South America. No genetic manipulation here! Its dazzling color results from a pigment called anthocyanin, which is also found in other plants, fruits, and vegetables such as blackberries, cornflowers, blueberries, and the skin of eggplants. Blue potatoes offer a more delicate taste than potatoes with white flesh. Cook them with their skin to preserve their beautiful color and all the nutrients it contains. Loaded with antioxidants, health benefits range from lowering cholesterol, reducing cardiovascular illnesses, protecting against eye diseases, and fighting against skin aging. Add a few drops of cider vinegar to the cooking water to keep the beautiful blue color bright. Make a notch on each tuber before cooking to ease the peeling process. Once cooked, place the potatoes in a bowl of ice water as this makes peeling easy. The blue potato can be prepared in many ways: chips, steamed, mashed, roasted or in salads. Truffe is the name given to this rhizome in some regions of France. Look for them at farmers markets and green grocers. The rest is up to you. Let your imagination fly, and surprise your guests with lovely colors on their plates. Looking for some ideas? Watch this video for a delicious recipe using colored potatoes. Enjoy! 8 Responses to "Food Postcard: Seeing Blue with Colored Potatoes"
I’ve heard of these colored potatoes, but haven’t tried any of them. I never see them in local grocery stores. Is there a good place to go to purchase them? I know that white potatoes have the least amount of nutrients, so I’d totally go for trying the blue ones! Plus, it’s great that they haven’t been genetically manipulated. Thank you Tami for your comment. These potatoes are incredible, fun and so healthy. I found mine on a farmer’s market in The Hague. I rarely see them in my greengrocer, even the Organic one in my neighborhood. I wish they were more easily accessible. Hope you can try them one time. thank you Lana. They are a lot of fun to surprise your family and guests, and are a wonderful and healthy alternative to the white potatoes. From the title, I thought you were suggesting sending potatos as a postcard at first haha.. Did you know that you can send some strange things like flip flops as mail in the USA? Maybe I should try a blue potato..
How funny Annie! Not sure I can send you blue potatoes through the mail. They might be all mashed up! How cool! I need to try these. I’ll be in Peru in a few months and will have to keep my eye out for them. How great it would be to taste the blue potato at its source! Let me know if you do and how you like it. Thanks Jaynie.